Graphic notation has a long history in western art music, some famous examples date back to the renaissance, but it is in the mid twentieth century when composers turned to graphic scores as a way of seeking new approaches to performance. In Sounding Art, Decibel commissioned visual artists to create works they could use as scores, exploring a variety of approaches to the relationship between visual art and sound. Brigid Burke’s ‘Burning Antrils’ is a large canvas whose spontaneous feel brings to mind the action painters of the 1950s; blotches of heavy impasto drip in squiggly lines while other areas are left bare. The ensemble matches this visual energy with coarse timbres, dry snaps of strings, the clicking of flute and clarinet keys and hushed, papery sounds in the percussion. All these create the impression of a feverish probe of the canvas’ surface. When pitches or unisons emerge, they are elusive and unstable, but Decibel navigates the craggy terrain with sureness and vigour. Matt Hunt’s film work ‘The Compositor’ employs simple filmic techniques reminiscent of dada and early film. Decibel reflects the sense of wonder in the seemingly naïve images; tinkling chimes play along rotating baubles; rumbling percussion and clarinet squeals accompany an earthquake scene in a barbershop, capturing the humour and unease of the situation. In another scene, Aaron Wyatt plays comical glissandi lines on the viola, mimicking the growls of a seal in a zoo. It is a charming, and at times disturbing soundtrack, but the ensemble’s straightforward approach is effective. ‘Meteorite Landscape II’ by Kevin Robertson is a painting depicting a meteor crash site, part of Robertson’s ongoing exploration of alien landscapes. An animated score is projected onto the canvas with a series of colour coded circles wandering the painting’s surface. The circles converge, follow one another and sometimes grow in size—an indication that the performer should take a more soloistic role. The ‘rover’ approach gives each performer a view of one small section of the painting, exploring the canvas as individuals while also responding musically to each other. Robertons’s painting, with its mix of flat and rugged areas, draws the musicians towards a more meditative investigation than some of the other pieces. Marco Fusinato’s ‘Mass Black Implosion’ is based on ‘Treatise’ (1963-7) by Cornelius Cardew, the score of which consists of 193 pages filled with enigmatic circles, lines, and squares. Fusinato draws straight lines in the original and ties them to a single point, creating an implosion-like effect on paper. The intention is to propose “a new composition in which every note is played at once, as a moment of consolidation and singular impact”. The band plays short and sharp unisons leaving variable lengths of silence that accrue in tension. The varied textures create an orchestral effect, with melodic lines that spiral down alongside abrupt thuds of percussion. The stop-and-start approach enacts the synergy of the piece’s concept, and is in contrast to the textural drone of the other works. ‘The Pact’ by Erin Coates is a video projection showing two women rock climbers performing physical feats in synchronised shapes. Coates writes: “The extreme physical exertion of these actions is visible in the straining muscles and tension in the bodies, as sheets of blood fall through the space and a sense of abstract horror slowly rises.” The tension and strain are not conveyed as well as they might, simply because of the small-sized screen. The horror has an absurd, even kitsch sensibility, with blood slowly dripping down the screen seemingly out of nowhere. Decibel’s score for this piece sounds like a 1970s slasher film soundtrack, with a continuous drone that pervades the action. The ensemble seems a bit too restrained at times, opting for a supportive role to the images. Tina Havelock Stevens’ video work ‘Up Above My Head’ mixes aerial shots of hedgerow and clouds with images of Stevens drumming in decrepit aeroplanes. The piece explores flight as a space in-between. It has a sense of melancholy with long, slow-moving shots, but also has perplexing kitsch elements like giant purple words like ‘UP’ overlaying half of the screen at times. Decibel’s music provides a roaming, textural score that explores a liminal sound-world rather than a narrative, giving space for Steven’s work to unfold in its peculiar way. The closing piece is a mixture of performance, installation, and participatory game. Lucas Abela’s ‘Glizzard Blizzard’ is a pinball machine made from bass guitars and other amplified components. Members of Decibel line-up to play while Cat Hope on bass guitar and Tristan Parr on electric cello cut loose on their instruments, filling the space with harsh noise. It is a different side to Decibel, moving away from the nuance of instrumental performance and exploring a more playful, industrial side of the band. 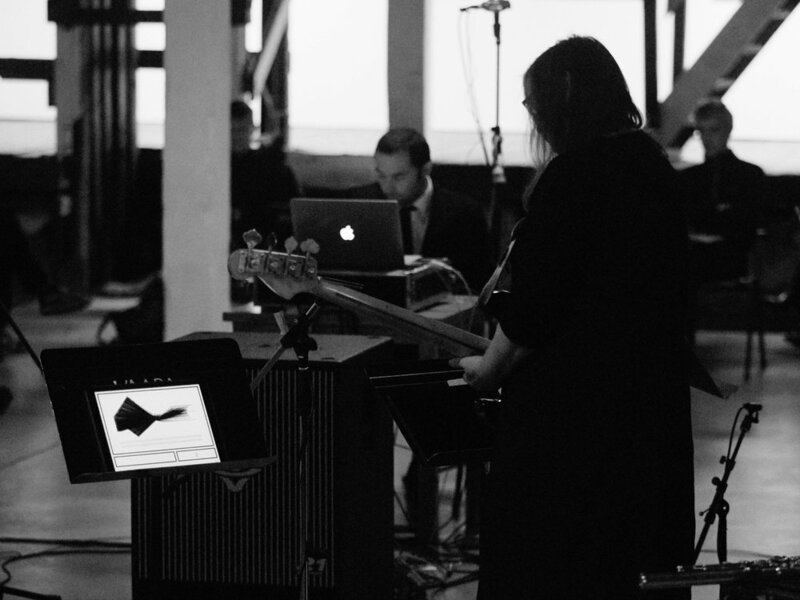 Sounding Art was memorable for showcasing the group’s spirited interplay, and represented another step in Decibel’s exploration of the intersection of sound art, installation and performance. For the audience it was a different concert experience, as the surrounding artworks and enveloping sounds allowed for an active engagement with the site.